Let's face it: Hospitals are not four-star hotels in the Air Force, the branch most often ribbed (fairly or not) by its sister services for enjoying comforts foreign to the military lifestyle. Even so, one can hardly expect to recover from illness or injury without proper attention to diet. That's where the Air Force's enlisted diet therapists come in, much like their counterparts in civilian healthcare settings. (No, they don't set your food down on the couch and start asking after its childhood experiences.) 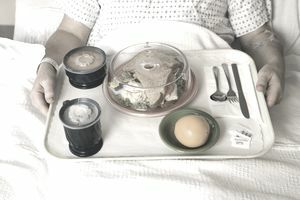 In addition to planning the normal daily menu for hospitalized airmen, diet therapists coordinate with healthcare providers to make sure patients with special dietary requirements imposed by their health status receive balanced nutrition that speeds recovery and avoids further complications. They also deal with special situations such as tube feedings and make rounds every so often to ensure the dietary regimen is working out for the patients. In line with healthcare's encouraging trend toward preventive education and treatment, diet therapists also take part in health promotion education for Air Force personnel, whether ill or well, teaching fundamentals of dietary management that help airmen stay happy, healthy, and . . . well, in the air. Like most Air Force enlisted specialties, applicants for diet therapy must have a high school diploma or fifteen college credits if they hold a GED. They must also take the Armed Services Vocational Aptitude Battery (ASVAB) and score 43 in general aptitude (an Air Force score composed of word knowledge, paragraph comprehension, and arithmetic reasoning.) The Air Force Enlisted Classification Manual also recommends that high school students planning to enter diet therapy complete "courses in mathematics, chemistry, biology, and food preparation," but this isn't absolutely necessary if you've got the scores to qualify. After basic training, new enlistees are considered diet therapy helpers and are assigned to the Medical Education and Training Campus (METC) at Fort Sam Houston, Texas. In order to advance to Air Force Specialty Code (AFSC) 4D031, apprentice, they'll have to complete two entry-level courses, spending in all about two months at the METC. The first course, Diet Therapy Fundamentals, is just barely longer than two weeks and introduces a class of ten to topics such as "safety, sanitation, and hygiene ... food operations ... and food preparation techniques," according to the METC course catalog. This is immediately followed by another month in the Diet Therapy Apprentice course, where airmen may also be joined by Army students. This course builds on the basic techniques from fundamentals and also develops a sound knowledge base for nutrition in the healthcare setting, including "basic nutrition concepts, medical nutrition therapy, and performance nutrition for health and fitness." METC offers a third two-week course for Air Force personnel, Nutrition in Prevention, though it doesn't appear to be part of the entry-level curriculum required to start work as a diet therapy apprentice. Judging from the description provided by the METC catalog, it's most likely a continuing education course to help airmen already in the 4D career field become better health promotion educators.